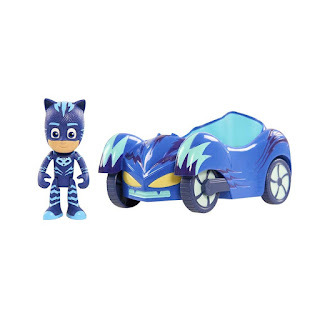 Go into the night and save the day with the PJ Masks Vehicles! The PJ Masks Figure and Vehicle Assortment comes with a 3" articulated Caboy figure and their signature vehicle. Each vehicle really rolls and can even fit three PJ Masks 3" Figures! Collect all three PJ Masks Figure and Vehicle Sets including: Catboy and Cat-Car, Owlette and Owl Glider and Gekko and Gekko-Mobile. Each figure and vehicle is sold separately.